Today, we’re announcing the exciting schedule for our Big Birthday Weekend. It’s Code Club’s fifth birthday too, making it even more special: a double celebration! We have a packed programme of activities this year. As usual, there’ll be talks and workshops catering to all interests and levels of skill, along with newly introduced drop-in sessions alongside the pre-registered workshops, offering everyone the opportunity to get hands-on experience of digital making. Once you’ve got your ticket for the Big Birthday Weekend, all the events are free, but some have limited places: make sure you take a look at the schedule and click the links to reserve your place at the workshops you want to attend. Edited to add: it seems the links in our schedule PDF don’t work in all browsers; if you have trouble, try Chrome, or download the PDF and open it in your favourite PDF reader. We hope to have all the events listed on their own web page soon. 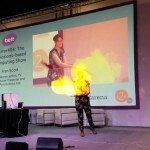 On Saturday, Dr Sam Aaron will close the show in the auditorium, live-coding music through Sonic Pi, and on Sunday, we have CBBC presenter Fran Scott who will be live-coding explosions! On arrival, be sure to collect your programme lanyard as this will be your pass for the day. Then grab a free goody bag and get exploring: the venue will be full to the brim with fabulous creations that members of our community have built, from talking heads to full-sized traffic lights. As always, you’ll be able to chat with our suppliers and gain information on the latest kits in the vendor marketplace. 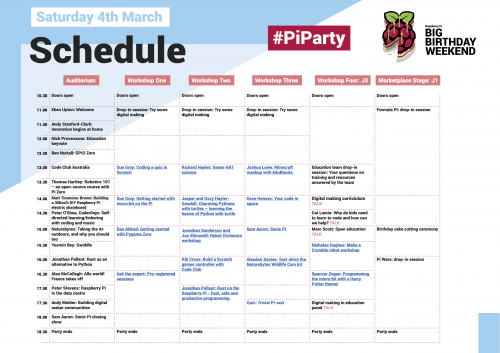 You can even sign up to our Raspberry Pi Quiz, ‘Trivial Pi-suit’, to test your knowledge against other teams and win prizes! Since it’s not a party without cake, we’ll be handing out cupcakes each afternoon. And those over 18 can use their complimentary token to grab a pint in the Market Bar from 3pm, thanks to Fuzzy Duck Brewery. Don’t have a ticket yet? There are still a few available via the venue website, Cambridge Junction, but be quick – they won’t be available for long! An added extra for Saturday: Live Retro Comedy Night at the Centre for Computing History. 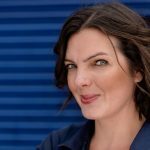 A one-off night of mirth!! Join us for geeky comedy featuring video games, VHS covers, 80s nostalgia, the supernatural, computing history, and movies. 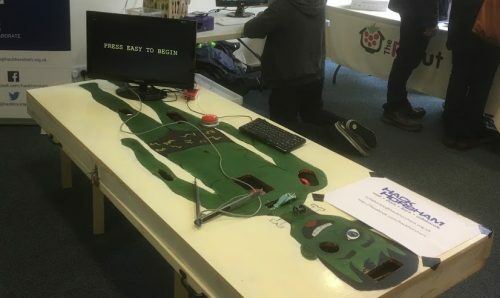 This is a fundraising event for Matthew Dons, a good friend of Raspberry Pi, with proceeds going toward his immunotherapy treatment for bowel cancer. 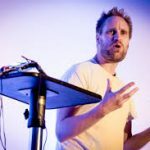 Eben and Liz Upton are set to be in attendance, and would love to see members of the Raspberry Pi community filling the seats. Grab your ticket here. Anyways happy birthday to you and hope great merriment is had by all. With the workshop sessions that are aimed at kids, can they be left or do they have to be accompanied? Would love to be there. Just can’t be. Maybe next year. I bought a ticket a few months ago but it looks as though I will not be able to make it due to family pressure. Hey…all the Saturday sessions claim to be full already. I’m coming all the way from Edinburgh with my two eldest kids and it would be a real shame if we were limited to just wondering around the venue all day. What a waste of a long journey that would turn out to be. 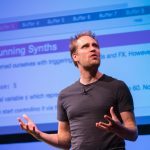 Nature Bytes, PyGame Zero and Sonic Pi would have been great. Are any tickets for these sessions held back for issuing on the day? I wish I could make this but unfortunately my schedule won’t allow it. From the schedule, it looks you all will have a great time! Would love to be able to see the live coding explosions. Will there be more spaces opening for some of the workshops? There are so many that are booked up already which is a shame. All the RPi’s are as good as they need to be. RPi strategy has always been to stick rigidly to the $35 price point. Other SBCs may offer more (e.g. faster processors, independent gigabit Ethernet or SATA interfaces) but they also price themselves significantly higher than $35. Keeping to the magic $35 price point requires continually seeking ever cheaper components and manufacturing techniques without skimping on reliability. This only comes with technological advancement over time, careful negotiation with component suppliers and manufacturers and clever streamlining of the board design and manufacturing process. The gains to be made get ever harder to achieve with each iteration. Also…I’ve never known Raspberry Pi to confirm anything in advance. They (and their trusted distribution partners) have always been very good at keeping tight-lipped until release day. Pi3 was released alongside their 4th birthday weekend so you never know…if they are planning a refresh, it might well be targeted for release alongside the birthday bash…but don’t expect to hear anything before then and don’t expect earth shattering improvements as they can’t be paid for with a dollar price hike. Now I do like that suggestion :) Nice idea nobuo. I’m marooned on the Isle of Wight without any hope of rescue so being able to watch it on, say, youTube would be ace. Maybe get the Raspberry Pi Guy to do a live walk around??? With all the interesting activities booked, it appears even concert space is not enough. Maybe next time you should consider renting out a whole city for the venue so multiple sessions can be run at once to allow all the disappointed children (and their parents) to join in the great hands-on learning. In fact, methinks the Queen should just declare a national holiday for the last day of February as Pi Day. This would entail a celebration of all things STEM, and also whereupon raspberry pie should be served throughout the day. Then take over the city of Cambridge to host the birthday bash so that families near and far can bring their kids for healthy doses of fun science, electronics, coding, Pi and of course delicious pie. Happy Birthday and Congratulations on, clearly to me, one of the finest projects ever. Still wondering why the release wasn’t delayed two weeks so it could be on March 14th (pi Day 3.14), but the elusive Feb 29 is also a cleaver choice.